Easily the best trip of the season. Can’t wait to come back! This was a trip to fairyland, to everything I imagined Hobbiton to be. It was hard to leave, reminding me of the great courage Frodo Baggins demonstrated in forsaking all this beauty to set out on his quest. His life’s flow brought him to extreme danger, ugliness, terror and ultimately, heroics. He had the courage to let his river carry him. Kayaking has shown me in a graphic way how to let my river carry me. 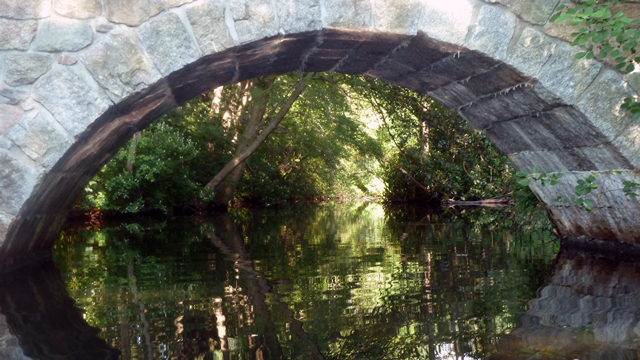 Some of the time the trip is bucolic, like this one to Lake Waban at Wellesley College. Other times the water gets rough and it can get dangerous. For today though, I want to share photos of a trip that was easily the best of this season. The conditions were perfect (90+ degree day, sunny and breezy) and the lake was teaming with families/clusters of birds. Enjoy the beauty and see if you can imagine your river. Approaching the stone bridge, and fairyland. This unusually large swan family had 6 cygnets (term for baby swan). Three cormorants enjoy the sun. Two black ducks sun themselves. The still waters reflecting the clouds. Absolutely breathtaking photos! Thank you for sharing the beauty of your trip. Hi, Susan — Looking through many of your posts, but was especially captivated by this one. Lovely photos and what a perfect day. I especially appreciated your insights! Thanks. It was a glorious day. I learned a lot about photography that day too! Thanks for sharing an interesting blogs for people who loves kayaking. Enjoy kayaking!